I was introduced to photography during a special time of my life and since then, it has brought out the best in me. I hold an incredible passion for documenting life and different cultures. Being a photographer allows me to translate the world as a universal language, no matter where we are. The essence of what I believe is joy and authenticity. You choose the place and way to celebrate it, and I will take care of having the best possible pages of this chapter for your life. What will make your photography experience unique and unforgettable will always be the love that you share with each other. 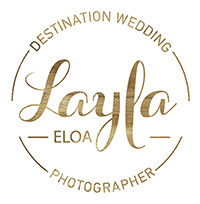 ( Layla Eloá was born in São Paulo and she has been photographing weddings since 2007. She photographed many weddings in the USA, Brazil, and other destinations. Layla is also part of the Green Wedding Alliance, a collaborative community of over 50 members of environmentally and socially responsible vendors, who strive to grow and inform their responsible business practices).